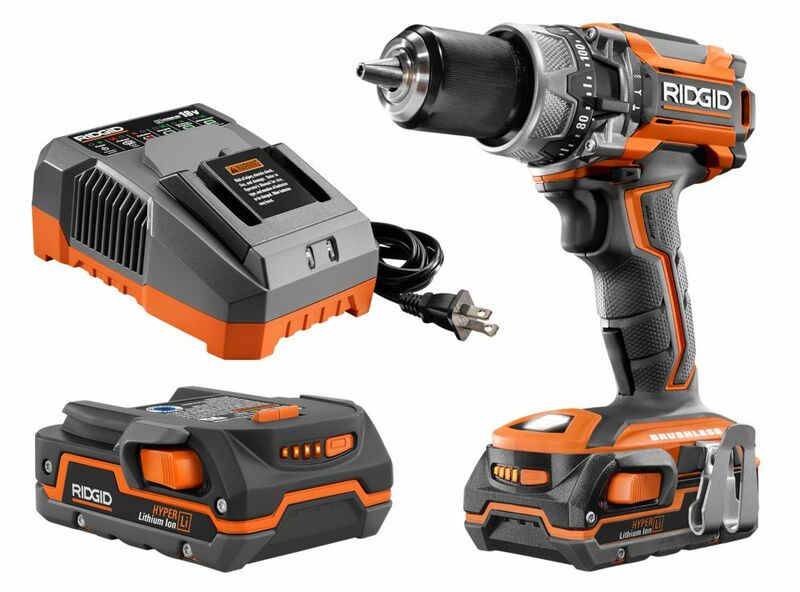 RIDGID introduces the GEN5X Brushless 18-Volt Hammer Drill/Driver Kit. This kit provides the power of a full-size hammer drill in a compact and lightweight size. RIDGID Brushless Motors offer up to 50% more runtime and longer motor life. With registration, this kit is backed by the Industry's Only Lifetime Service Agreement. DeWalt's 20V MAX Lithium-Ion Hammer Drill belongs to the brand's premium line of tools, ideal for heavy drilling and fastening applications. The drills clutch includes 22 torque settings to match a variety of fastening applications while the all metal gear case and all metal ratcheting chuck provide complete tool durability. The DeWalt Heavy-Duty 3/8-inch VSR Mid-Handle Drill has an 8.0 amp motor that delivers high performance in heavy-duty applications, and a 3/8-inch all-metal ratcheting keyless chuck for greater bit retention. It features 02,500 RPM, and VSR trigger for versatility in drilling and fastening applications. A mid-handle grip design with soft grip offers increased balance and comfort, while an all-ball bearing construction provides greater durability and longer tool life. It also includes a heavy-duty kit box. Gen5x 18V Lithium-Ion 1/2-inch Brushless Cordless Compact Hammer Drill Kit RIDGID introduces the GEN5X Brushless 18-Volt Hammer Drill/Driver Kit. This kit provides the power of a full-size hammer drill in a compact and lightweight size. RIDGID Brushless Motors offer up to 50% more runtime and longer motor life. With registration, this kit is backed by the Industry's Only Lifetime Service Agreement. Gen5x 18V Lithium-Ion 1/2-inch Brushless Cordless Compact Hammer Drill Kit is rated 4.7 out of 5 by 268. Rated 4 out of 5 by JonL from So far seems to be a very good tool. 1.5... So far seems to be a very good tool. 1.5 amp hour batteries are a little on the small side but they work. Brushless motor makes fairley high pitched whine which is slightly annoying but there's a lot of noise and construction anyway. All in all seems to be a very good tool. I love Ridgid tools. Rated 5 out of 5 by Kenny from Super tool and buy!!! Love warranty.... Super tool and buy!!! Love warranty. Does this set come with 2 batteries or 1? The first image shows 2 batteries but the description says 1. Can someone clarify? Hi Herrberk, This kit includes 2 x 18-Volt 1.5Ah Battery. Is the battery charger of this device also compatible with 220v ??? Hi Denis17, It's not compatible with 220v only 120 v.